We arrived in Sydney on Friday afternoon and stopped at a set of traffic lights, only to have an older gentleman open our bus door and sit down before the light changed to green. It’s been too long since we spent time with my father, and so this weekend’s visit to Australia’s iconic city — and the home of my dad — was overdue. Upon entering my dad’s apartment, the girls remembered the fun games they’ve enjoyed there in the past, and it didn’t take long before they had dismantled the couches to build cubby houses. Even though it was late in the afternoon, the girls tempted the neighbourhood parrots with birdseed on the balcony while my dad served apple pie and ice cream to celebrate our arrival. We left the bus parked at my dad’s and walked to a supermarket to stock up on supplied before catching a bus downtown. 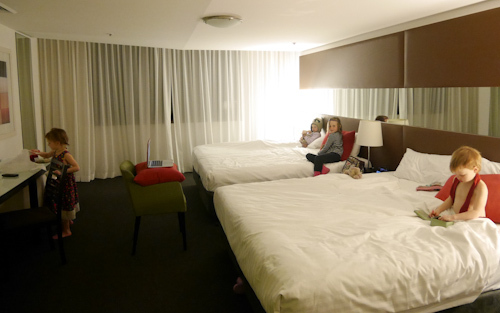 My dad had booked a family room at The Vibe Hotel as a treat, and the girls were super excited to explore our room and its amenities. 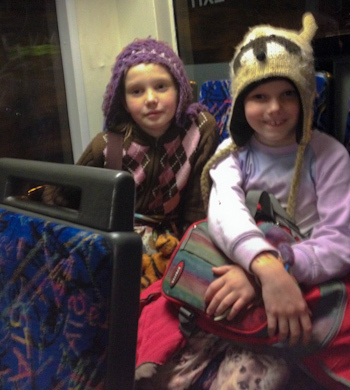 It's been too long since we've travelled on public transport, and so riding the Sydney buses is very exciting. 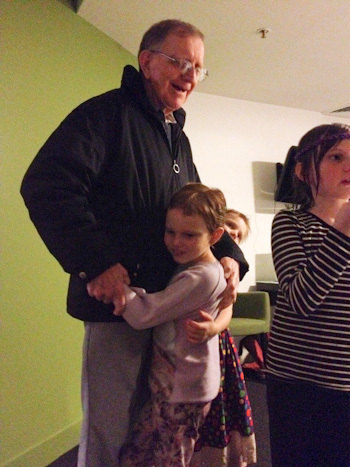 The girls revel in the attention of their grandfather — he's the reason we came to Sydney! 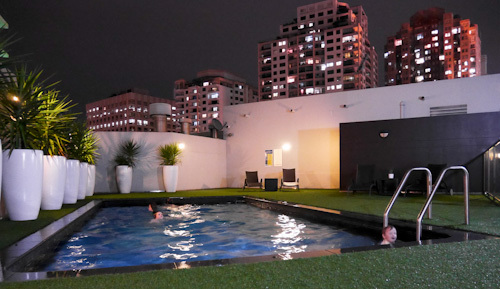 The evening is mild and the water is heated, so it doesn't take long for us to decide to go for a night-time swim in the hotel's rooftop pool. When the girls have finally had enough, we return to our room and enjoy the novelty of the huge beds. 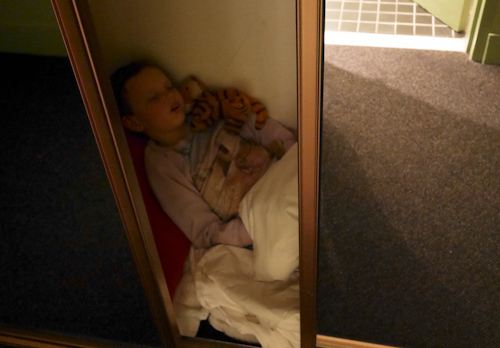 Although she has two king-sized beds to choose from, Brioni prefers to make her own bed in the closet. We're only on the eighth floor, but because of our proximity to the other buildings, the girls can't manage to see the ground no matter how they crane their necks. My dad joined us for several outings around town, doing a great job of keeping pace with the energetic girls. We loved looking at the variety of architecture in the tall buildings around us and spoiled ourselves with treats from an international food court. 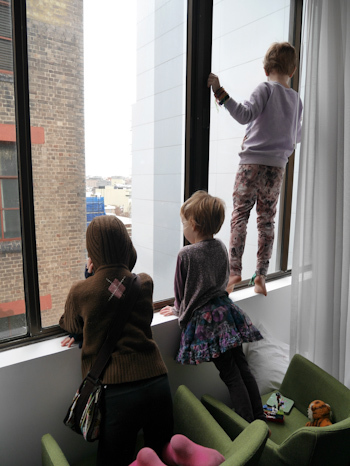 However the city delighted us, the main attraction for our family remained the hotel where we took every opportunity to return to the swimming pool! 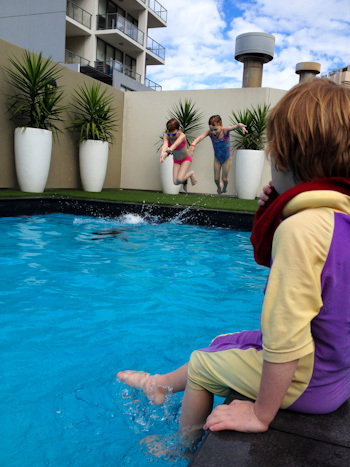 Yes, it's officially wintertime, but the day is mild enough for us to spend a couple more hours at the pool. Thanks so much for the wonderful stay, Dad! You know how much we enjoyed ourselves — especially in spending time with you.